Over the holidays, Cross Country Skier was able to catch up with U.S. 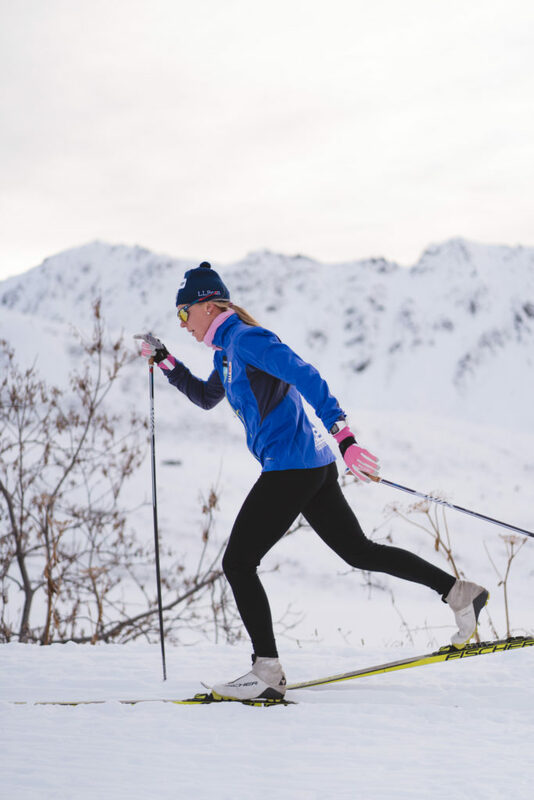 Ski Team Veteran Sadie Bjornsen as she prepared for the 2019 Tour de Ski. We asked her how she feels about her season, about life on the road, what she’s looking ahead to and how the team dynamic has changed after some high profile retirements. Cross Country Skier (XCS): You’ve had some great results early this season, how do you feel about your performance so far? Sadie Bjornsen (SB): It has been really fun and exciting to get on my first skate sprint podium. That was a goal of mine for this season, so it was fun to achieve it so early in the season [at the Lillehammer World Cup] so I can carry that momentum and confidence into lots of skate sprints to come this season (there are nine skate sprints and three classic sprints in the season). I tend to start the season “ready to rumble,” and I think that largely comes from having so much injury in my past. It is not uncommon for me to not be able to wear shoes for the weeks and months leading into the season because of flared up heel spurs. Or having some form of tendinitis that keeps me from running throughout the training season. One thing that comes from this “adversity” is an extra ability to fight in my brain. The privilege of standing on the start line suddenly becomes a whole new level of opportunity that often leads me “firing hot” out of the gate in period one. It is fun to follow a similar pattern this fall, and have the confidence to know that I can fight for a podium position in any type of event I start on the World Cup. XCS: Were there any major changes to how you trained this past summer and fall? SB: I had one of my healthier seasons injury wise this past summer and fall. For the first time, I had the confidence to truly follow the plan that works for me rather than try to mold into the image of what others are doing. I have always had to train differently. I don’t do high and low volume weeks, but instead just stay pretty stable throughout the season in order to keep a similar load on my muscles and tendons. I also do more training sessions with lower volumes. It is not uncommon to group a ski and a run together, or a swim and a ski erg. My training seems to have lots of modes, and I have even made my coach make new tabs in my training log to match my “Sadie style.” Swimming, ski-erging, and Nordic walking are pretty highly participated columns in my log. This past summer I finally had the confidence to believe in my style more than ever before. With this came an ability to safely push my limits, because I was committed to controlling my activity seven days of the week, therefore always controlling the larger load on my tendons. XCS: Kikkan Randall and Liz Stephens had been on the World Cup circuit for years, is there a different feeling now that they’re retired? What has changed? SB: There is certainly a different feeling, but the same vibe without some of the staple teammates from the past couple of years. We certainly miss the heck out of Holly, Liz and Kikkan. But, each of us has had to transition into a new role and a new position, which I have loved. I think this is what helps us grow as athletes, teammates and people. Liz and Kikkan were really good at leading by example, rather than leading by preaching. For that reason, I think it forces us younger girls to step up to our level and play. I am really proud of the way our team is currently operating and interacting with the younger generation. I think we have only scratched the surface as far as what is to come! XCS: Do you feel like you’re more of a leader now that they’ve both retired and you’re one of the more experienced team members? SB: I certainly do. I think that my different path has led me to be a leader by acceptance. As a team, it is easy to push everyone to try to look the same. If one person is successful, maybe we should all do that in order to be that good. I have never believed in that type of teamwork. I have always been one to accept the differences in personalities, lifestyles, goals, and training styles. I do my best to swarm people with acceptance. I think a leader’s role is to see, hear and value each individual’s needs and skills. Already, I can see this new young D-team is coming from so many different places. I have tried my best to connect with these young girls, and show them my story, but also empower them to find their own way of getting here. Rosie, Ida, Sophie, Jessie and I are all like books. We are full of experience, knowledge and success, but no book looks like the other. I have really enjoyed feeling like I have been able to share some of this with the next generation. XCS: What does your schedule look like for the rest of the season? Are you in Europe until World Cup finals? SB: I will be racing and training in Europe until the end of the season. This year I am going to try to get a little more control of my body and form a little training block leading into the Championships at the end of February. After that, I will be doing anything and everything—because it is all fun and grit after that. Who can hold on tightest for the longest? The World Cup season is quite long, so remaining focused and on queue to fight from the gun is always the challenge. But part of me really loves that type of racing, man versus mind style! XCS: Can you share any of the ways the team celebrates the holidays overseas? I imagine it might be a time when you could get pretty homesick. SB: It is easy to get homesick during the holidays, but after six years of spending Christmas overseas, our team has started to develop our own “family traditions.” We always do a Secret Santa gift exchange where you draw names out of a hat, and you have to anonymously either draw a picture or write a poem for that person. We have been doing this for years, and I still have all my poems tacked on my wall at home. It is a night of so much laughing and love, it fills your soul right up. I also do a good job of having Christmas decorations in the hotel room, whether that is just a few lights, or a mini Santa. Depending on my roommates’ tolerance, I also start the Christmas tunes as soon as I arrive in November. And finally, for the actual holiday, I am lucky that I have my French family in Europe. While the French traditions are different, I have always been lucky to be filled with family fun during the holidays. With that said, I really look forward to the day I get to spend it with my American family!